Imagine, 50 victories in a season four seasons running. That, my friends, is impressive. For Mike Babcock, reaching that impressive mark puts him alongside Hall of Famer Scotty Bowman, who also happens to be Babcock's friend when Scotty was a consultant with the Wings. "The part I like better is Scotty Bowman's the only other guy who's ever done it," Babcock told Dave Dye of the Detroit News. "For me, being as good a friend as I am with Scotty and holding him in such high regard, that's very, very special for me. "But all it means as a coach is you've got good players. That's the facts. If you don't have real good players and real committed people, you're not winning 50 games." Detroit became the third team in League history to win 50 in four straight, joining Boston (1970-74) and Montreal (1975-79). "Sometimes we tend to nitpick ourselves too much," goaltender Chris Osgood said. "Our players tend to think they're not doing too well when they are. Fifty wins is 50 wins no matter how you get there. That's a great accomplishment." Remember back in mid-February when the Pittsburgh Penguins were struggling to the point that coach Michel Therrien was replaced despite taking the Pens to the Stanley Cup Final in June? At that point, you could have made a pretty solid case that a berth in the 2009 Stanley Cup Playoffs was a long shot, at best. But today, you can make the case that one team you don't want to see in the playoffs are the same Pittsburgh Penguins. "A lot of people were waiting for us to fail and not make the playoffs; to have two games left in the season and playoff spot for this team -- that's a huge achievement," Petr Sykora said Tuesday after a 6-4 win against Tampa Bay that was followed by a 6-1 win against the Islanders. "The second year after you have success, especially for a young team, is always hard," Sykora told Rob Rossi of the Pittsburgh Tribune-Review. "It's hard to come back, make the playoffs and make a run. Last year I felt very confident when we made the playoffs, and this year I feel confident we can do it again." A lot of the credit must go to Dan Bylsma, who stepped in from the Wilkes Barre-Scranton Penguins of the AHL with no NHL head-coaching experience and got the Penguins back on track. Bylsma is quick to shrug the credit to his players, never a bad idea when you have Evgeni Malkin and Sidney Crosby sitting among the NHL's top scorers. But even beyond the two superstars, Bylsma has gotten everyone going. GM Ray Shero also gets credit for acquiring Chris Kunitz from Anaheim. In 19 games, Kunitz has 7 goals and 11 assists. Ditto Bill Guerin, who has 5 goals and 7 assists in 16 games in Pittsburgh. "We tried to play a certain way and we're still getting better at it," he said, Bylsma told Rob Rossi of the Pittsburgh Tribune-Review. "We're still not there yet, but we played the right way and it made for a remarkable turnaround." Nowhere to go but up -- Brian Lawton is confident the Tampa Bay Lightning will be much improved on defense next season. In a meeting with season-ticket holders, Lawton said the Bolts will make improvements to the roster, especially on defense, where 14 players have suited up for games this season. "The reality is our blue line has been really weak from the start," Lawton said, according to Erik Erlendsson in The Tampa Tribune. "Now we've been ravaged with injuries to guys like Andrej Meszaros and Paul Ranger, but even with those guys we have to do a better job with our D.
"We will be active and aggressive on our blue line once again this summer. And with Ranger, Meszaros, Matt Lashoff and Matt Smaby, who has really started to come on, we feel that we have a foundation that we can build off of." Lawton assured the fans that the team has the pieces in place to make a quick turnabout, rejecting the idea the Lightning are rebuilding. Got a question, comment or complaint about all things hockey? Well, you have come to the right place. Drop a note to iceage@nhl.com and join in the mailbag fun. "We have good pieces in place, with Vinny Lecavalier and Martin St. Louis and Steven Stamkos; Mike Smith has proven that's he capable of handling the role of a No. 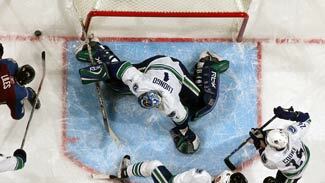 1 goaltender," Lawton said. "We are not in a rebuilding mode, that's not our thinking. "We are not like Pittsburgh, which went through four, five, even six seasons of losing. We don't have that luxury. That's not the situation we are in." Happy for the moment -- Dale Tallon is justifiably proud of his Chicago Blackhawks, who are back in the Stanley Cup Playoffs for the first time since 2002. But as any experienced hockey guy knows, now the hard part begins. "You're never satisfied, but I feel better about things now that we've gotten ourselves into the playoffs," Tallon told the Chicago Tribune. "Boy, it's been a long road. It's nice to see some of our labor starting to come to fruition. "I'm happy for our staff," Tallon continued. They've done a really good job of preparing this team -- coaches and trainers and scouts, everybody involved to try and get us to this level. We've worked hard to get to this point." Key factors for the Hawks have been a return to health by Martin Havlat, the continued emergence of Patrick Kane and Jonathan Toews, the emergence of Kris Versteeg, Andrew Ladd and a solid defense anchored by Brian Campbell and Duncan Keith. "Every year we've gotten better and we continue to keep improving, and that's the goal," Tallon said. Vital piece of the puzzle -- Heading into the weekend, Willie Mitchell had 3 goals and 19 assists in 81 games, so he won't be challenging Washington's Mike Green for the League lead in scoring by defensemen. But don't assume Mitchell hasn't been just as valuable to the Vancouver Canucks as Green as been to the Caps. "It's been a good year, but it's been a product of how the team is playing as well," Mitchell told Derek Van Diest of the Edmonton Sun. "I've always seemed to play on teams where we haven't scored a lot, but this year we've been able to score a little more. So if you're on the ice and you're not getting goals scored on you, which is something I take pride in, obviously your plus-minus is going to go up." And in Mitchell's case, it sits at a very nice plus-28 after 81 games. With 81 games in the books, the Buffalo Sabres stand at 40-32-9, good for 89 points, but not good enough for a playoff berth. So, what went wrong? "We haven't been able to push through offensively," coach Lindy Ruff told Bucky Gleason of the Buffalo News. 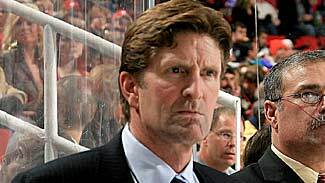 "The identity we're trying to create is a puck pressure team that plays an up-tempo, two-man front. That should lead to a lot of pretty good offense. The problem is, when you play like that, the mistakes that you make if you don't convert show up on the offensive side." "It's tough to identify a team when you go into one game and play really, really well and go into the next game and you play not well in all areas," center Derek Roy said of the team's inconsistency. As you might expect, Ruff takes the blame. "I think I have to stand here and take some of the heat," Ruff said. "It is about developing. It is about building around players. It's about trusting players. It's about knowing that players will have a tough time. It's tough right now." "It's a lot like last year," Thomas Vanek said. "It's inconsistent. We have stretches where we play great, where we can play with every team in the league, and stretches where we look real bad and real average. That's what we are right now. We're an average team outside of the playoffs and looking in. That's tough." "The thing about Willie, is that sometimes there are games where a player struggles," Canucks assistant coach Rick Bowness said. "But when the game is on the line, some players are able to get out of those struggles and their intensity level goes up, and they can just focus on playing well for those last 10 minutes. Willie is able to do that. If it's a 3-2 game and you are trying to hold on to a one-goal lead all of a sudden his game can go up. That tells you what kind of competitor he is. "When Willie first came here, you knew what you were getting defensively because he is very reliable and he can shut down anyone," Bowness said of Mitchell, who signed with the Canucks as a free agent in 2006. "But he moves the puck well and he shoots the puck as well as anybody on our defense. We've told him from Day 1 to shoot the puck more and he's doing that and getting more points. He's shooting the puck a lot quicker and he's getting a lot more points because of that." For Mitchell, his 3 goals, 19 assists and 22 points are all career highs. That is by design as Mitchell decided to shoot more rather than just dump the puck into the zone. "I really looked at Sheldon Souray's game," Mitchell said. "I don't know why sometimes in your career things go off in your head and this year I started to shoot the puck more. "In the past, a lot of times I would get it and push it back along the wall. Now, I'm shooting at the net and if I can't hit the net, I'll shoot it toward the net. That's been different for me and I've been able to provide some offense. I don't get any power-play time, so I take pride that I'm able to chip in that way." Inspiration in Columbus -- If the story of Ryan Salmons doesn't inspire you, then perhaps you should consider another sport. Ryan is 19 and you might remember that he was signed to a contract by the Columbus Blue Jackets on March 27. Why is Ryan such an inspiration? He is terminally ill, but continues to soldier on, with an overwhelming desire to see his Blue Jackets play in the Stanley Cup Playoffs. That desire will soon be realized, as the Blue Jackets did their part. The dates and opponents will be decided this weekend. As part of his contract, Ryan gets tickets to that first playoff game in franchise history. "It's been a huge reality check," Jason Chimera told Tom Reed of the Columbus Dispatch. "It makes you realize you have to squeeze every moment out of life. It makes you hug your son a little harder because you never know. "I have given Brad (Salmons, Ryan's dad) a couple of hugs, too. I can't imagine what he is going through. But now being a dad, I know what it's like to have a son you love." "Jason really has taken upon himself to help us get in the playoffs for Ryan," Columbus captain Rick Nash said. "You can see how important it is to him." Injuries have scuttled a good portion of Chimera's season. He enters the weekend with just 47 games played and underwent surgery in early March to correct a groin problem. It was during that recovery time that he got to know Ryan Salmons. "It has put life in a new light," Chimera said. "You're injured and then you walk into the (pediatric cancer) unit at Children's (Hospital) and you see people really struggling. "I see those kids and they always have smiles on their faces, and you ask Ryan how's he's doing and he says, 'Great.' It's helped me get through a tough time, which is nothing compared to what these kids go through." Ryan has received many Jackets-related items during the past year. His father recently purchased a green No. 25 "O'Chimera" jersey at the team's St. Patrick's Day-inspired auction. The $530 gift, which benefits the Blue Jackets Foundation, is not for Ryan, however. "That jersey will one day belong to Cale Chimera," Brad Salmons said of Chimera's son. "It's something his son should have." Getting his groove back -- When your team doesn't make the playoffs, you take your positives where you can get them. In Edmonton, that means taking a look at Sam Gagner. A solid rookie season (13-36-49 in 79 games) was followed by a tough start (2 assists in 15 games, 2 goals and 7 assists in his next 20) and thoughts of the dreaded sophomore jinx. But thanks to a strong second half, Gagner, with 16 goals and 25 assists in 74 games heading into weekend play, has righted his game. "I worked pretty hard in the offseason and I thought I was pretty prepared," Gagner told Joanne Ireland of the Edmonton Journal. "I had pretty high expectations of myself coming in. When it doesn't happen right away, you begin to panic. "I started to get my game back and now I'm feeling a lot better," Gagner said. "It's been a great learning experience for me. I'm just hoping I can continue to play the way I have." Remember, Gagner is just 19 and was the sixth selection in the 2007 Entry Draft, so expectations may have been a tad high. But since playing on a line with Robert Nilsson and Patrick O'Sullivan, things have taken off, scoring 10 goals and 11 assists in 18 games. "Is it realistic to think a guy is not going to have a setback at 19 years old at this level? 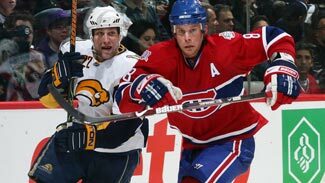 It takes time," coach Craig MacTavish asked. "He's doing a lot of things better. "It takes time to physically mature," MacTavish continued. "With that physical maturation comes better speed. You learn the game. You know the game better. Even with the vocal part of being on the bench, he is stepping up in a lot of ways. He is giving us great leadership for a guy who is 19." Getting on the same page -- With three straight seasons of 30 or more goals, Brian Rolston looked like he was going to be the scorer the New Jersey Devils wanted when he returned as a free agent this summer. But an early high-ankle sprain slowed Rolston's start to the point where he has scored 15 goals and 15 assists in 63 games. But with the playoffs fast approaching, Devils coach Brent Sutter is looking to see more. "There are my expectations of Rolie, what the organization's expectations are for him and what his own expectations are for himself," Sutter told Rich Chere of the Newark Star-Ledger. "He's had to get his level of play up to where it needs to be so he can fit in properly with certain guys. And injuries are all part of it. "He got hurt and when he was out, those top two lines started really going. You don't want to shake that up. What happens is one or two guys' play drops off and he is given an opportunity. So it's finding the right chemistry and fitting into certain places." Rolston said it took him 10 to 15 games to feel comfortable after returning on Dec. 4 from a bad ankle sprain. But he concedes he still feels discomfort in the ankle. "Yes, but it's not a factor in my game," he said. "Not at this point."